February 8, 2017, Corbett, Ore: Menucha Retreat & Conference Center and Cascade Blues Association present the fourth annual Blues in the Gorge, Oregon’s premier acoustic blues guitar camp, held at Menucha in the Columbia River Gorge, about 30 minutes from Portland. Dates are September 30 – October 4, 2017. 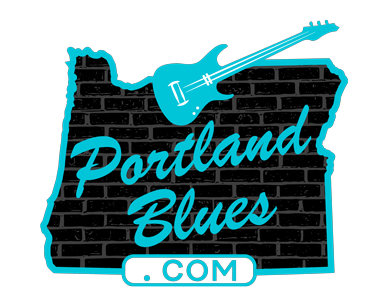 Blues in the Gorge is five days with four outstanding instructors in a beautiful setting. Guests immerse themselves in music, enjoying up to four workshops each day and instructor concerts and jams each night. There is an early bird discount of $100 off for those who register before the end of March. Space is strictly limited to 46 participants to ensure plenty of instructor attention for all. Registration is open at menucha.org/programs/blues. Instructors will present a Blues Masters concert open to the public on Sunday, October 1, at 7:00 p.m. Location TBA. 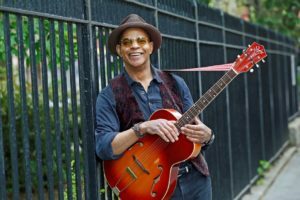 Guy Davis’ parallel careers – as a musician, an author, a music teacher and a film, television and Broadway actor—mark him as a Renaissance man, yet the blues remain his first and greatest love. Growing up in a family of artists (his parents were Ruby Dee and Ossie Davis), he fell under the spell of Blind Willie McTell and Fats Waller at an early age. Guy’s one-man play, The Adventures of Fishy Waters: In Bed with the Blues, premiered Off-Broadway in the ‘90s and has since been released as a double CD. He went on to star Off-Broadway as the legendary Robert Johnson in Robert Johnson: Trick the Devil, winning the Blues Foundation’s “Keeping the Blues Alive” award. He followed the footsteps of another blues legend when he joined the Broadway production of Finian’s Rainbow, playing the part originally done in 1947 by Sonny Terry. Along the way he cut nine acclaimed albums for the Red House label and three for his own label, Smokeydoke Records; and was nominated for nearly a dozen Blues Awards. Davis has earned acclaim for his deft acoustic playing, his well-­‐traveled voice and his literate, yet highly accessible songwriting. He’s taken his music to television (the Conan O’Brien and David Letterman shows) and radio (A Prairie Home Companion, Mountain Stage, World Cafe, E-­‐Town), as well as performing at theaters and festivals. And he’s played the four corners of the world, with a recent tour taking him from the Equator to the Arctic Circle. Mary Flower’s immense fingerpicking guitar and lap-slide prowess is soulful and meter-perfect, a deft blend of the inventive, the dexterous and the mesmerizing. Her warm-as-honey-and-whiskey voice comforts like a winter quilt and soothes like a summer breeze. An internationally known and award-winning picker, singer/songwriter and teacher, the Midwest native relocated to Portland in 2004. 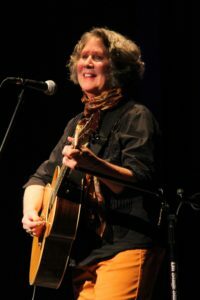 She continues to please crowds and critics at folk festivals and concert stages domestically and abroad, including Merlefest, Kerrville, King Biscuit, Prairie Home Companion and the Calgary Folk Festival, among many. A finalist in 2000 and 2002 at the National Fingerpicking Guitar Championship (top 3 both years, and the only woman), a nominee in 2008 and 2012 for a Blues Foundation Blues Music Award, and a 2011 and 2014 Portland Muddy Award winner, Flower embodies a luscious and lusty mix of rootsy, acoustic-blues guitar and vocal styles that span a number of idioms – from Piedmont to the Mississippi Delta, with stops in ragtime, swing, folk and hot jazz. Flower’s 10 recordings, including her last four for Memphis’ famed Yellow Dog Records – Bywater Dance, Instrumental Breakdown, Bridges and Misery Loves Company – show a deep command of and love for folk and blues string music. For Flower, it’s never about re-creation. Her dedication to the art form is a vital contribution to America’s music. He is a singer, instrumentalist, record producer, songwriter, session player, teacher, the top dobro player on the West Coast and, above all, an instinctive and sensitive musician. As his entry in the Encyclopedia of Northwest Music (Sasquatch Press 1999) states, he has become a vital figure on the NW music scene in the thirty-some years he’s lived there, appearing on over 400 CDs, movie and video soundtracks, commercials, producing 22 CDs for other artists, hosting a roots music radio show, and appearing in the 1997 film “Georgia” with Jennifer Jason-Leigh and Mare Winningham, on the Prairie Home Companion radio show and on Jay Leno’s Tonight Show. 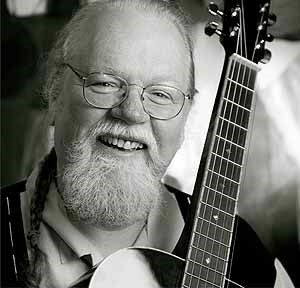 Orville is also known as a patient and insightful teacher of music and has taught often at the Puget Sound Guitar Workshop as well as the International Guitar Seminar, Pt. Townsend Blues Workshop, Euro-Blues Workshop, B.C. Bluegrass Workshop and others. He has several teaching videos and DVDs and CDs of his own music available. Valerie Turner is a native New Yorker with roots in Virginia and Georgia. She plays finger style Country Blues guitar which is a broad genre that includes blues, fiddle tunes, ballads, country and popular songs, ragtime, and gospel. She also dabbles with washboard, spoons, and banjo. Valerie’s first Country Blues guitar lessons were with Jack Baker in Greenwich Village and her eclectic repertoire was later influenced by her studies with both John Cephas and Woody Mann. She is an exceptional finger picker and her guitar playing is reminiscent of traditional blues greats like Mississippi John Hurt, Etta Baker and Elizabeth Cotton. 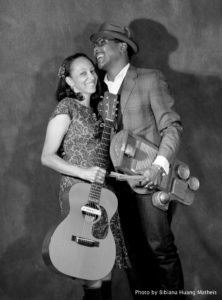 Turner and her husband perform together under the name “Piedmont Bluz.” They are dedicated to the preservation of Country Blues and the Piedmont style and their mission is to help keep this rural, east coast tradition alive by educating audiences about this unique aspect of African American culture through musical entertainment. They have been entertaining audiences at venues from Washington State to Jerusalem and are much loved wherever they go. The duo feel that “there are stories to tell, people to remember, and things that must be said” so they weave a bit of history into the presentation of each song. Located 30 minutes from the Portland airport in Oregon’s Columbia River Gorge National Scenic Area, Menucha is just down the road but a world away. For over 60 years Menucha has hosted nonprofit groups, family reunions, etc., in our historic property, nourishing them with home cooked meals and inviting them to wander our 102 beautiful acres. Menucha also welcomes individuals who come to programs we offer in the areas of faith, music, and art. Our mission is enriching lives through hospitality, learning, reflection and renewal.